Have you ever watched Campus PD? I know this is supposed to be an on-topic thread, but since that's G4 I'll allow it and not cornfield myself. I don't want to say the cops profile on that show or anything but, if some dude has a rear window made out of plastic grocery bags, that dude is probably going to jail. Big thanks to dabeezkneez84 for today's ... whatever-that-is. 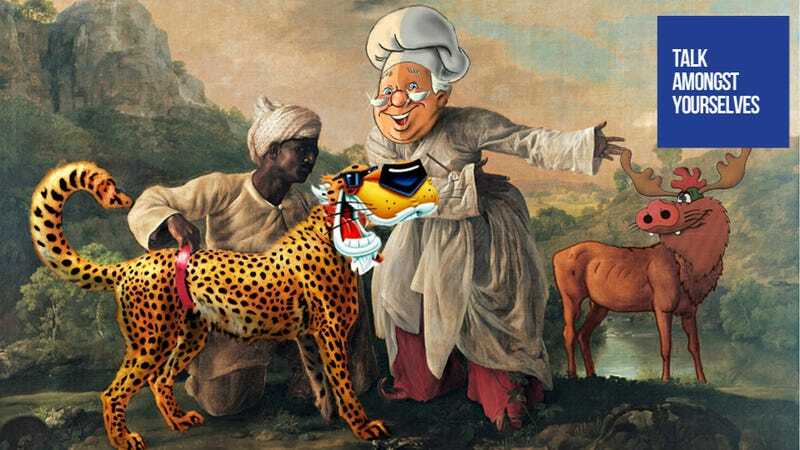 My guess is with Chester Cheetah, it's a stoner's fever dream. Speaking of Campus PD. We've only got two more days with this month's TAYpic image, then there's a new one on Wednesday. So if you don't crack the roster with this base image, fear not, another one usually turns up a new batch of TAY all-stars. See this thread for details, just make sure your final image is of a 16:9 dimension and is funny. Now talk amongst your sleeves, gang!